To wallow in tranquility, breathtaking natural beauty and exciting activity come to the beautiful city - "Gangotri". It is among the most significant sacred places in India. Positioned at a height of 11,204 ft above sea level in the charming state of Uttarakhand, Gangotri is flocked by thousands of pilgrims from every nook and corner of the world. It offers you an opportunity to come closer to nature. Its calm aura, spiritual ambience and emerald beauty leave the visitors flabbergasted and astonished. 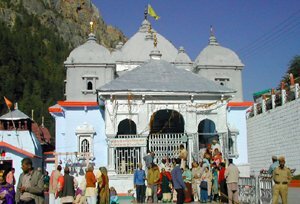 Gangotri is one of the four Char Dham Sites of Uttarakhand. Also dubbed as an abode of Goddess Ganga, one would feel connected to god in the high elevation of Gangotri. The existence of the snow clad mountains and the magical water of the river Ganges add to the purity of the destination. It is certainly a fantastic spot that brings happiness to all faces. 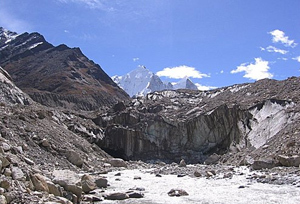 History of the pious destination Gangotri can be traced from the ancient Hindu mythologies. According to it, King Sagar's grandson Anshuman remained unsuccessful to bring Ganga on earth and same was with his son Dilip. However, King Anshuman's grandson Bhagirath was very resolute for this task and meditated at Gangotri. After numerous years of meditation, Ganga came down from the paradise but remained in suspense in the coils of Lord Shiva's hair. Determined to bring Ganga, King Bhagirath started meditation in order to win Lord Shiva. Being pleased with it, Lord Shiva released the Ganga as three streams. One of these streams came on the earth in the form of Bhagirathi. The stream of River Ganga ashes embraced the ashes of 60,000 sons of King Sagar and they all rose to their eternal rest. The reef on which it is deemed that the King Bhagirath meditated is dubbed as 'Bhagirath Shila' Perched close to the shrine of Ganga. Gangotri Temple: One of the prominent shrines in Gangotri, Gangotri temple is dedicated to Goddess Ganga and is positioned near the sacred stone known as Bhagirath Shila, where it is said that the king Bhagirath paid his homage to Lord Shiva. The height of the shrine is about 20 feet and white granite has been used to build it. It was erected by Amar Singh Thapa, a Gorkha Commander in the early 18th century and later it was reconstructed in the 20th century by the Maharaja of Jaipur. The temple is nestled amid the beautiful surroundings of deoder and pine trees. The lush-green environment and the chants of 'Mantras and Slokas' provide a very peaceful feeling and transport you to another world. 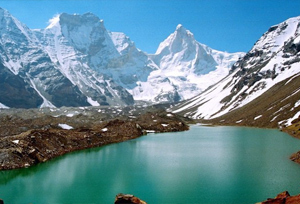 Kedar Tal: A transparent lake nestled at an altitude 15,600ft in Uttarkashi district of Uttarakhand, Kedar Tal is a wonderful creation of god and is the idyllic place for a long trek of 17km. The trek starts from Gangotri and leads you through a variety of wonders that will make you rapt and spellbound. Make sure that you get your health check up done well in advance and pack all the necessary items to have a pleasing trekking expedition. Vishwanath Temple: Within a walking distance from bus stand in Uttarkashi, Vishwanath Temple is one of the most legendary temples of this region. The temple is addressed to Lord Shiva and folks from all across the globe pay a visit to this very old temple. Tapovan: A camping base situated at an elevation of 4460mts above sea level, Tapovan is a perfect trekking route that lets you experience a real adventure along with the sight of the Shivling peaks and rich vegetation. Bhaironghati: It is a temple of Bhairon that is just 10km away from the Gangotri. It is amongst the most popular tourist attractions in Gangotri, because it is believed that the Lord Shiva appointed Bhairon to protect the picturesque region. Submerged Shivling: It is essentially a natural rock Shivling that according to the legends, where the Lord Shiva sat to hold the Ganga in his hair locks. Gangnani: It is popular for its enchanting thermal springs and the mesmerizing view of the snow-clad Himalayas. During the months of winter, it remains crowded with locals and tourists who come here to have a glimpse of beautiful Mother Nature from wide and far. Gomukh: It is an awe-inspiring place from where the divine river Ganga originates. The devotees are fascinated by the tranquil environment that makes it a most sought after place to pay a visit while on a trip to Gangotri. By Air: The nearest airport to Gangotri is Jolly Grant Dehradun. It is around 24 kms from Dehradun and 226 km from Gangotri. The visitors can hire the private cars, taxis or take the road transport buses from the airport to reach Gangotri through Rishikesh.